The Milwaukee freeway system, for the past 50 years, has served as the backbone of commuter and commercial traffic in MILWAUKEE COUNTY and southeastern Wisconsin. Contrary to urban myth, the system was built with democracy as a central characteristic. Engineers did not develop the system without public input or implement it over the objections of a majority of Milwaukeeans. 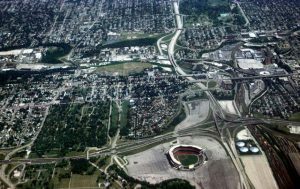 Milwaukee’s twenty-first century freeway system is fragmented and incomplete, in part because it was built by different public authorities over a long period of time. Funding for the freeway system was provided by the federal, state, and county governments, though the exact mix depended on whether the routes were designated as interstate or non-interstate. It consists of all interstate highways that were built as proposed, including I-94, I-43, I-794, and I-894. Another, the Fond du Lac Freeway (WI-145), was built by the State Highway Commission but not in cooperation with the Milwaukee County Expressway Commission. The Stadium North Freeway (US-41) ends just south of North Avenue. A four-mile gap now exists between the Stadium North and Fond du Lac Freeways, though in September 1975 County Executive John Doyne proposed building a “Gap Closure Freeway.” The Stadium South Freeway (US-41) was removed when MILLER PARK was built, being named Miller Parkway. The Park East Freeway (WI-145) existed until 2002-2003, when it was torn down as part of a larger transportation deal involving Governor Tommy Thompson, County Executive Tom Ament, and Mayor John Norquist. Notable freeway interchanges on the present system include the Airport, Hale, Marquette, Stadium, and Zoo Interchanges. Prominent interchanges never completed include the Greenfield, Hillside, Lake, and Park. The Milwaukee freeway system, started by the City of Milwaukee during the mayoralty of FRANK ZEIDLER, resulted from sustained public interest in and push for improved transportation from 1946-1978. During those years, the program received electoral and political support from the general public, elected officials at all levels, the Milwaukee press, business community, and labor unions. The Milwaukee County Expressway Commission, established under the 1953 expressway statute (Wis. Stat. 59.965), was an apolitical transportation agency charged with bringing an expressway system to the community. By the time of the passage of the Interstate Highway Act of 1956, the City and County of Milwaukee had spent eight years planning and constructing freeway segments in Milwaukee County. 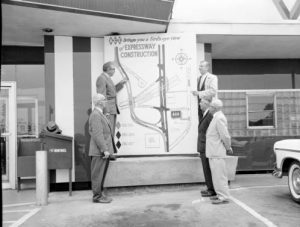 In 1968, the Commission was given responsibility for improving mass transit and was renamed the Milwaukee County Expressway and Transportation Commission. The Commission ceased operation in 1980. In public referenda in 1948, 1953, and 1967, city residents voted for two expressway bond issues and construction of lakefront expressways. The 1948 expressway bond issue is significant because it involved several candidates for mayor who would be on the Milwaukee political scene for a long time—Frank Zeidler, HENRY MAIER, and HENRY REUSS. Zeidler was opposed to the bond issue, yet as mayor he started freeway design and construction. Maier and Reuss supported the bond issue, yet at the end of their political careers wanted to be known as anti-freeway. In March 1954, the City freeway program was formally transferred to Milwaukee County under the expressway statute. City and suburban opposition to proposed routes made it clear that only a larger governmental body could manage this significant political, financial, and engineering responsibility. Passage of the expressway bill in late 1953 was a significant instance of city-suburban cooperation. 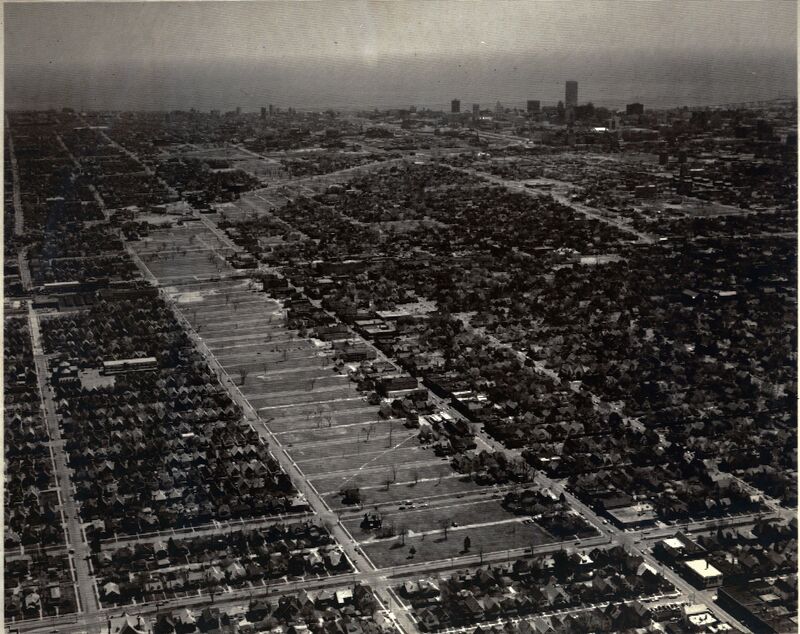 For the April 1967 lakefront expressway referendum, expressway opponents secured a misleading question on the ballot. To vote in favor of the freeways, proponents had to vote NO. As Congressman CLEMENT J. ZABLOCKI, a strong and consistent freeway proponent, said, “Now, at the 11th hour, a small group of individuals seeks to block construction of the Lake and Park Freeways. By circulating a misleadingly worded petition, they obtained enough signatures to place a similarly misleading referendum on the Apr. 4 ballot.” Despite the confusing ballot, city residents voted 2:1 in favor of construction. In November 1974, the Milwaukee County electorate was given the opportunity to vote on the five remaining freeway segments programmed for construction: the Park West, Park East/Downtown Loop, Stadium South, Airport Spur, and Lake South Freeways. Instead of one question authorizing construction of all, freeway opponents like County Supervisor Daniel Cupertino insisted on five, thinking that at least one would be voted down. Contrary to this assertion, city and county voters approved all five freeway segments. Equally significant was the fact that black voters strongly supported additional construction. Construction was approved in districts where anti-freeway individuals, such as Daniel Cupertino and Cynthia Kukor, insisted that their constituents did not want them. It is interesting to note that opposition to the Park West Freeway in the 1974 freeway referenda was no different statistically than city resident opposition to the original 1948 expressway bond issue. Ultimately only one non-interstate freeway of the five, the Airport Spur, was built (1978). Another, the Lake South, opened in 1999 as a scaled-down version (WI-794, Lake Parkway). The remaining freeways were abandoned due to a rise in anti-freeway elected officials (particularly future Milwaukee Mayor John Norquist), effective citizen and neighborhood organization opposition, political reversal by long-standing leaders (particularly Henry Maier and Henry Reuss), and several temporary court injunctions resulting in delays and ultimately increased construction costs. Lands for the Park East, Park West, and Stadium South were released back to local governments for redevelopment. Approximately $52.3 million in public funds were spent on freeways not completed, and the Lake Freeway was significantly underutilized by the motoring public for twenty-two years. Milwaukeeans who previously lived in the freeway corridors experienced significant disruptions to their lives, only to see that they were moved for freeways never built. Most significantly, Milwaukee has never known the benefits of a completed transportation system. Freeway opposition has existed in Milwaukee since 1947. Then, homeowners along Highland Avenue were opposed to an east-west expressway proposed by the administration of Mayor John Bohn. While the City expressway bond issues passed in 1948 and 1953, 47% and 26% of Milwaukee voters, respectively, opposed those bond issues. In the battle over the Lakefront Expressways in April 1967, 34% of Milwaukee voters opposed completion of those projects. 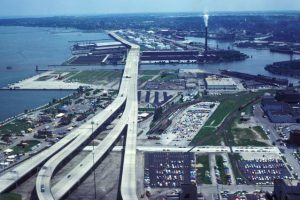 These levels of opposition did not become a full-scale revolt in Milwaukee, however, until two decades after the initial and extensive governmental commitments toward freeway construction. Neighborhood residents—most prominently in the Sherman Park (Park West Freeway), Jackson Park (Stadium South Freeway), and Bay View (Lake South Freeway) areas of Milwaukee—opposed the completion of long-standing freeway plans. They argued that freeways split their neighborhoods and families and destroyed the local housing stock. These concerns were joined with other concerns, such as degraded environmental quality (increase in noise and smog); loss of property tax revenue; facilitation of the movement of population and businesses to the suburbs; and a general concern that completion of the approved and programmed system would lead to more freeway construction in the future. Milwaukee today has an incomplete freeway system that has compromised mass transit in addition to automobile and truck transportation. The first generation regional transportation plan created by the SOUTHEASTERN WISCONSIN REGIONAL PLANNING COMMISSION (SEWRPC) and approved by the Milwaukee County Board and County Expressway Commission proposed additional freeway flyer routes on the Park, Lake, and Stadium Freeways. The plan also included an exclusive busway along I-94 that was taken to preliminary engineering. It was abandoned due to the opposition of County Supervisor F. Thomas Ament. Freeway opponents, whether those in the city or county in the 1940s or during the late 1960s and early 1970s, were correct that freeways did have costs. There were significant costs in areas including neighborhood impact and housing. But like all public programs of significant scope, such as Milwaukee’s ANNEXATION program in the 1950s and early 1960s, there are costs and there are consequences that cannot be accurately predicted at the beginning. By 1974, a majority of Milwaukeeans were completely familiar with the costs and benefits of freeways, and yet they still voted for a complete system. ^ This entry was first posted on January 19, 2016. It was removed on May 21, 2018. A revised version was published on January 21, 2019. ^ “Zablocki Blasts X-Way Foes,” Milwaukee Journal, March 28, 1967, Local Section, p. 1. ^ “Freeway Foes Undermined,” Milwaukee Journal, November 7, 1974, p. 1, 3. ^ The author has previously discussed opposition to Milwaukee freeways in his writings. See Mayor Frank P. Zeidler: Transportation Development in Post-War Milwaukee (Kansas City, MO: Public Works Historical Society, 2006); The Politics of Congestion: The Continuing Legacy of the Milwaukee Freeway Revolt (Kansas City, MO: Public Works Historical Society, 2000); “Bridging the Great Divide: SEWRPC, Politics, and Regional Cooperation,” Marquette Law Review 81 no. 3 (Spring 1998): 705-760; “The Politics of Congestion and Implementation: Milwaukee’s Freeways and the Proposed Light Rail and Transit System,” Marquette Law Review 78, no. 3 (Spring 1995): 675-733. The author’s current copyrighted manuscript on the Milwaukee County Expressway and Transportation Commission also contains discussion of freeway opposition in Milwaukee. ^ The October 27, 1969 edition of the Milwaukee Journal provided a useful chart comparing housing demolition and construction in Milwaukee during the nine-year period of 1960 through 1968. The article explained that 16,544 housing units were demolished during that period while almost twice as many—32,463—were built. The statistics also show that the City of Milwaukee demolished more housing units for its programs (urban renewal, code enforcement) than either the County (freeway program) or the private sector. “Freeways Carve Paths of Destruction,” Milwaukee Journal, October 27, 1969, p. 1, 18. ^ Paul G. Hayes, Master Planners: Fifty Years of Regional Planning in Southeastern Wisconsin: 1960-2010 (Milwaukee: Marquette University Press, 2010), 99. Casey, James J. Jr. Mayor Frank P. Zeidler: Transportation Development in Post-War Milwaukee. Essays in Public Works History #25. Kansas City, MO: Public Works Historical Society, American Public Works Association, 2006. Casey, James J. Jr. The Politics of Congestion: The Continuing Legacy of the Milwaukee Freeway Revolt. Essays in Public Works History #20. Kansas City, MO: Public Works Historical Society, American Public Works Association, 2000. Cutler, Richard W. Greater Milwaukee’s Growing Pains, 1950–2000: An Insider’s View. Milwaukee: The Milwaukee County Historical Society, 2001. Dickenson, Gregory. “Through Highways: Construction of the Expressway System in Milwaukee County, 1947-1977.” MA thesis, University of Wisconsin-Milwaukee, 2015. Milwaukee County Expressway and Transportation Commission Annual Reports, 1954-1980, on file with The Milwaukee County Historical Society.